Here's a neat looking gadget: a hand-held shredder! 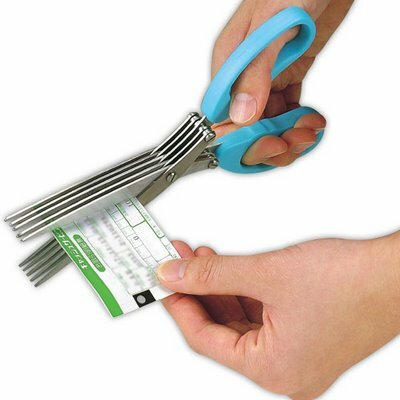 Works just like scissors, and costs under $20. I haven't actually tried one, so I can't say for sure how well it works, but it seems like the perfect thing for someone who only occasionally needs to shred a few pieces of paper and doesn't want to waste electricity or take up space with a bulky shredder. I could see if you were shredding small pieces, but I bet cutting 8.5x11 paper gets old pretty fast! Then again, I love my shredder(s) and didn't spend much more than the cost of those scissors. Completely off topic, but on the off chance Compact reads this blog...it annoys me when sites do not make their shipping costs easily found nor has an email or toll free number to call and ask. You probably don't need to shred entire pieces of paper. You can shred just the parts with personal information and just enough of forms to prevent people from filling out your forms. I like that this doesn't use electricity. You can also separate the shredded bits to make them harder to put back together. For example, you can put them in different trash bags or put part in the trash, part in the recycling and part in the compost heap. Those are some intense scissors. I wonder if they are heavy or not. Although the product is cool looking I wouldn't trade in my shredder, ten blades can't compete with 40 plus or the speed of my shredder. The scissors could be good for arts and crafts. Good point abt only needing to shred the important parts. I always try to schedule shredding day to coincide with when I clean out old gross stuff from the refrigerator, and I like to use the same bag for both. I got too busy to shred and let it pile up for months. This weekend I sat down and did it all. It can be really hard to tell where the important parts are. Some of it's obvious, but just as I would go to throw away what I thought was a form letter, no identifying parts, my eye would catch the "Dear Bitty Mylastname," or worse, a form pre-loaded with ALL my personal info. I especially despise the checks the credit card companies spend. Your shredder uses far less electricity than your television or your computer. Space may be a concern but our shredder is the size of a small trashcan. Also, it only cost $20 and it cross-cuts. That thing looks too gimmicky to me, but if you like it, more power to you.